Now that 82-year old Christopher Plummer has finally won an Oscar, why not partake in a movie where he robs a bank in a Santa outfit and things just get freaky from there? As someone who is proud to have never watched The Sound Of Music, Christopher Plummer is a good actor but nobody whose films I would actively watch out for. But as a fan of weird, little movies few have ever heard of, I got excited when I found out that 1978’s The Silent Partner was available on YouTube (Note: while Part 1 is safe for work, later scenes may be inappropriate for some audiences). Directed by Daryl Duke and adapted from a Danish novel and film, The Silent Partner stars Plummer as a bank robber who terrorizes Elliott Gould, who steals from his employer as he is being held up by Plummer. One of the first (and best) movies of the era of Canadian tax shelters, The Silent Partner won the Canadian Film Awards for Best Picture and Director. The film site Canuxploitation has gone so far as to claim it as an allegory between Canadian and U.S. relations, and how Canadians (represented by the charming but dishonest bank teller) aren't so different from Americans (the charismatic yet sadistic thief). Gould is an acquired taste; his quick fall from superstardom has tainted much of his accomplishments from his peak and since. However, his role here as Miles Cullen shows why he was so good and so popular. Gould can still be likeable even while embezzling from his job, while turning the tables on a sadistic criminal, or as he disposes of someone’s corpse. On the other hand, Christopher Plummer has been a stage and screen legend for his entire career, and is still receiving praise in his early 80s for Up, The Last Station and Beginners, for which he finally received his first Academy Award. Perhaps the most memorable scene (out of many) is its climactic end, where Plummer returns to the scene of the crime to collect his money from Gould. Since is it not the holiday season by this time, he comes in wearing a Chanel dress and a woman's wig. According to Plummer's 2008 autobiography, In Spite Of Myself, it was his wife Elaine's idea that he dress in drag, with his transvestitism informing his motives and eventual demise. Extremely outdated (and wrongheaded) symbolism aside, it makes for a great ending, and I have to admit, Christopher Plummer makes a reasonably believable (and attractive) woman. The rest of the film is rounded out by a solid cast and crew. One-time Oscar nominee Susannah York plays one of Gould’s love interests, while John Candy has some screen-time as their likable but naive co-worker. Curtis Hanson, who would later direct L. A. Confidential, Wonder Boys and 8 Mile, adapted the screenplay, while Canadian jazz legend Oscar Peterson (who was an old friend of Plummer's) composed the score. The Silent Partner is a solid movie, what some have called one of the best sleeper films of the late 1970's. It has several disturbing moments, and when a major character is killed I was actually surprised, in spite of the YouTube link's warning of "aquarium endangerment". If you want to see just what all the hype about Elliott Gould was about, or if you want to see Christopher Plummer at his best but with fewer wrinkles and no Von Trapps whatsoever, this is a good place to start. 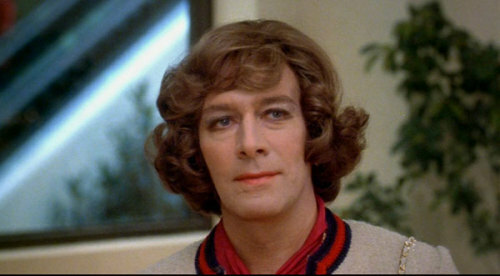 I love that dressing in drag was Christopher Plummer's Wife's idea. He makes an awfully good looking woman. What a man won't do for his wife!